A student working behind the scenes on Bus Stop Films' short 'Kill Off'. Since 2009, Sydney’s Bus Stop Films has provided a film studies program and filmmaking opportunities for people with intellectual disabilities. The not-for-profit has long advocated for a more inclusive screen industry. Last week, Bus Stop Films was recognised by the Australian Human Rights Commission, who bestowed the Community Organisation Award on the NFP at the Human Rights Awards. For co-founder and executive director Genevieve Clay-Smith, it’s an affirmation of Bus Stops' work and the role that film can play in advocacy. 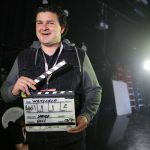 Clay-Smith is passionate about breaking down the barriers to entry in the screen industry and rectifying a general attitude about what people with a disability are capable of. “There are so many people out there with the potential to do really great things and bring a very unique story to our screens,” she said. Bus Stop Films' beginnings can be traced back to one of Clay-Smith’s first jobs as a filmmaker, when she was enlisted to help make a documentary for Down Syndrome NSW. The experience introduced her to Gerard O’Dwyer, whose goal was to be actor. “When I first met Gerard, the first thing that came out of his mouth was a Shakespeare soliloquy; the entire balcony scene from Romeo and Juliet,” Clay-Smith said. “I saw this guy with so much talent, and yet I felt heartbroken and a pang of injustice… It’s hard enough to become an actor without a disability." Clay-Smith decided to cast O’Dwyer in the lead role in a short film she was making for university, Be My Brother. She also brought on people with a disability to work in the crew. The film went on to win Tropfest in 2009, and O’Dwyer was named Best Actor. Post-Tropfest, the filmmaker and producer Eleanor Winkler began running workshops, and continued to make films using inclusive crews. A partnership with Sydney Community College opened up the opportunity to develop a curriculum and create an accessible film school. Over the years, Bus Stop has developed a range of industry partnerships that have led to work experience and mentorships for students. The placements and school have built students’ esteem, said Clay-Smith, in addition to establishing career pathways for them. “What we’ve found is that film studies is a very unique way to develop people, and help them gain further English skills, work ready skills, living skills and confidence,” she said. Bus Stop Films has now partnered with AFTRS and will run three film studies courses at the school during 2017. One of Bus Stop Film’s recent shorts is Kill Off, starring Jamie Brewer from American Horror Story. Bus Stop brought the actress out to Australia for a recent advocacy event at AFTRS. “She was a really good role model for our students,” Clay-Smith said. “Coven, that season of American Horror Story – there was no mention of her character having Down syndrome in the script." Bus Stop Films is a key partner in Screen NSW’s Screenability program and two Bus Stop students and a Bus Stop volunteer with a disability were recently selected for the program’s paid internships. Clay-Smith predicts there will be an increase in similar initiatives, noting a growing “rumble” to address inclusiveness in the industry. This has been spurred, she said, by the success of recent gender parity initiatives such as Gender Matters and She Shoots. “It’s starting to shift. People are waking up to the various other minority groups that have not had equal opportunity.